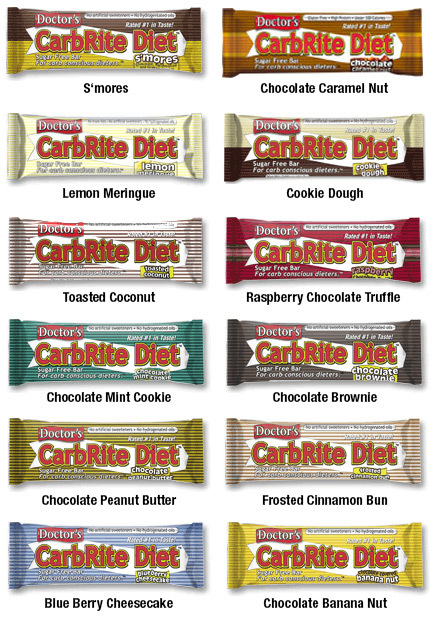 CarbRite Diet Bar is a sugar-free bar with 12 different flavors for the gluten free, low carb lifestyle. INGREDIENTS: Isolated Soy Protein, Glycerine, Whey Protein Concentrate, Sugar-Free Chocolate Flavored Coating (Maltitol, Cocoa Butter, Chocolate Liquor, Sodium Caseinate, Milk Fat, Soy Lecithin, Vanilla, Natural Flavor, and Salt), Maltitol Syrup, Water, Hydrolyzed Protein, Polydextrose, Peanut Flour, Peanut Butter, Peanut Flavor, Sodium Chloride, and Almonds. Bars are very sweet even though they are zero sugar. The majority of buyers liked the taste and it’s also not difficult to find a favorite flavor with 12 to choose from. Buyers describe the bars as very chewy and soft, but can stick to your teeth. Water should be drunk after eating it. 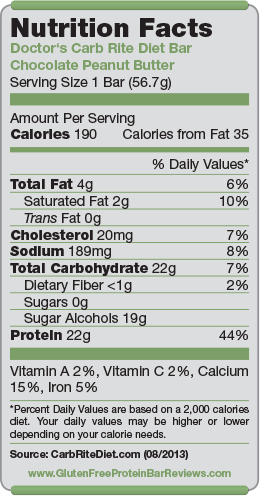 Carb Rite Diet bars are very low in fat and place on top of our comparison chart in the fat per gram column. They have zero sugar and zero artificial sweeteners. However, they are very high in sugar alcohols. 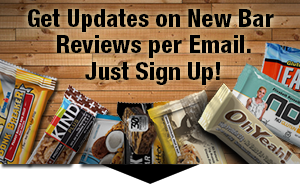 With soy as it’s primary source of protein it might not be on everyone’s preference list. Also contains Maltitol, which can cause gastric distress. 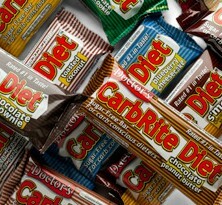 With $2.25 per bar at retail and 22 grams of protein, Carb Rite Diet Bars are one of the most affordable protein bars on the market, if protein is your biggest criteria.